Hewlett Packard Enterprise (HPE) reported its first quarter 2018 results today. Revenue improved 11% to $7.7 billion mainly due to broad-based growth across all segments. Tax reform benefits came in at $0.58 per share. Excluding tax reforms and other items, adjusted EPS was $0.34, which is an increase of 21.4% vs. prior year period. Starting first quarter, the company has made changes to its reportable segments; the new segments will be Hybrid IT, Intelligent Edge and Financial Services. By fiscal 2019, HPE plans to return $7 billion to shareholders through share repurchases and a 50% increase in dividends starting from the third quarter of 2018. For the second quarter of 2018, the company expects diluted GAAP earnings to be between $0.10 to $0.14 per share and adjusted earnings in the range of $0.29 to $0.33 per share. 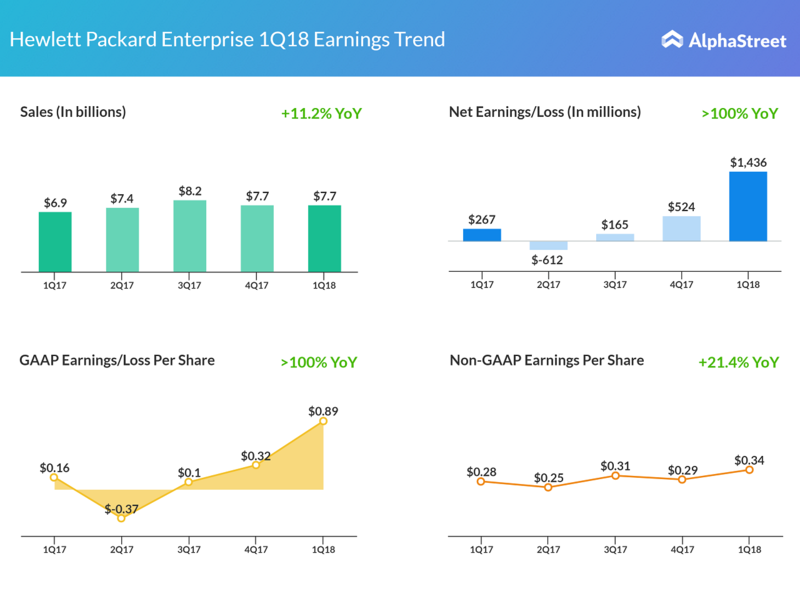 For fiscal 2018, HPE estimates GAAP and non-GAAP EPS to range between $1.35 to $1.45.